Oblong box cover (13x27 cm). 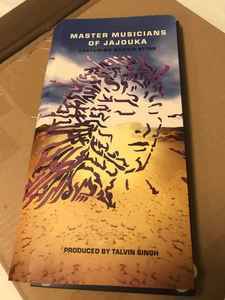 Includes a leaflet with biographies on The Master Musicians of Jajouka and Talvin Singh on one of the leaflet and notes by Talvin Singh and William S. Burroughs on the other side. CDr is a burnt Philips CDr with a plain white insert with black lettering, listing the song titles.